This has to be the all-time best tip you can get. You can read all the information you want, but the only way to truly learn is by doing it over and over. It’s how you learned to drive your car, right? So take some cones and mark out pretend scenarios, like backing into a campsite, turning through some tight corners, etc. 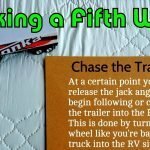 Learn how your RV reacts, how long it takes the trailer to turn and how much extra room it takes to make that turn. This is also a good time to get a feel for the braking. Towing a trailer makes the stopping distance greater and the braking practice will give you a sense of how much distance is going to be a safe distance to stop. One thing you have to appreciate is how much mass you are moving around. With the trailer hooked up, your movements must be slow, steady and deliberate. If you perform any jerky movements, you’re not going to be able to correct the motion the same way as in a car. I see this issue all the time on the freeway when folks pulling trailers do a jerky quick lane change and then spend 10 seconds trying to get the trailer to stop fish tailing. When braking, remember that even though you may have electric trailer brakes, they won`t stop on a dime. Always give plenty of space in front of you in case a panic stop takes place ahead. I have had more than one occasion where I rounded a corner only to find a line of stopped dead cars waiting in a construction zone. When braking, remember that even though you may have electric trailer brakes, they won`t stop on a dime. Always give plenty of space in front of you in case a panic stop takes place ahead. I have had more than one occasion where I rounded a corner only to find a line of stopped dead cars waiting in a construction zone. Make sure the tailgate is down! You’ve seen all those trucks with bashed up tail gates, well now you know why. Also, on the flip side, when you’re done make sure that your tailgate is up or you will carve out a nice hole in your RV’s front cargo bay door. Always attach the emergency brake cable. At least in the unlikely event, the trailer comes unhitched it will stop itself. Before raising the front jacks too far after hook-up, give the trailer a tug test with the truck to make sure the hitch jaws are fully engaged. This step can save your truck bed rails from getting squished by a falling fifth wheel. This is a good time to check that the trailer brakes are working too! Always chock your wheels, even if the ground seems really flat – you never know, better safe than sorry. Don’t let people distract you while doing the hitch operations. Too many bad things can happen if you forget something. Keep the hitch lubed and clean. I use a round vinyl lube plate on my pin and works great. Check the nut and bolt torque settings every once in a while too. I have a routine for hitching and unhitching that I always do the same way. Now its second nature and I’m less likely to forget something. Before each departure, Anne and I go through our checklist and I confirm that each of the tasks was done. When you’re towing it’s your responsibility to have complete attention on the truck, trailer, and road. Don’t be chatting on the phone, playing with the radio, trying to read the map, etc. Unlike a car, your recovery and reaction time is limited due to the weight and size of your RV. Every second counts if an emergency maneuver is required. I don’t even let Anne play a podcast while we drive unless we are on a wide open expressway with little traffic, or unless she wears headphones. I like to listen to all the noises and sounds, so if anything sounds different I’ll quickly know. Hearing the sound of a tire hissing or axle bearing squealing early enough can mean the difference between slowly pulling over and frantically trying to maintain control. Mirrors are your best friend when towing. Make sure you set yourself up with ones that are big enough and set far enough out from the vehicle to see all the way down the trailer side to its back. I set mine so I can see both the trailer walls and the tires. This way I can see if a tire is running low, or worse of one is blown. The next thing to do is add blind spot fish eye type mirrors. 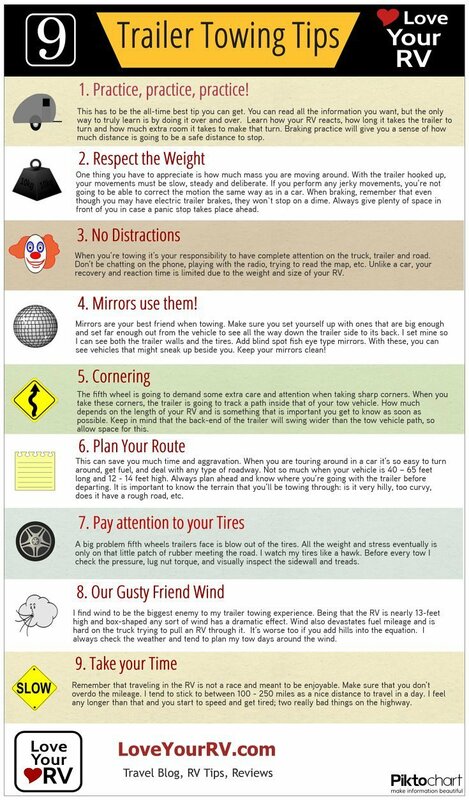 With these, you can see vehicles that might sneak up beside you, your trailer roof line and are a great aid when backing up the trailer. Always keep your mirrors as clean as you can and check them often to watch what’s happening behind you. The fifth wheel is going to demand some extra care and attention when taking sharp corners. When you take these corners, the trailer is going to track a path inside that of your tow vehicle. How much depends on the length of your RV and is something that is important you get to know as soon as possible. The more you practice, the better feel you’ll have as to how wide of turn you will need. During the turn take it slow, and check your mirrors to make sure the trailer is clearing the corner. Also, keep in mind that the back-end of the trailer will swing wider than the tow vehicle path, so allow space for this. 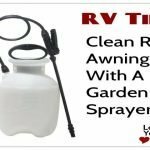 This is very important in tight campgrounds where I’ve witnessed many small crunches to sides of people’s RV as they scrape an obstacle such as a tree or post; or worse yet the electrical pedestal or water tap! Also, keep in mind that the back-end of the trailer will swing wider than the tow vehicle path, so allow space for this. 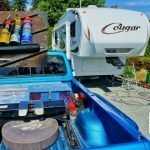 This is very important in tight campgrounds where I’ve witnessed many small crunches to sides of people’s RV as they scrape an obstacle such as a tree or post; or worse yet the electrical pedestal or water tap! This can save you much time and aggravation. When you are touring around in a car it’s so easy to turn around, get fuel, and deal with any type of roadway. Not so much when your vehicle is 40 – 65 feet long and 12 – 14 feet high. Always plan ahead and know where you’re going with the trailer before departing. It is important to know the terrain that you’ll be towing through: is it very hilly, too curvy, does it have a rough road, etc. Where are the easy in and out fuel stops is a valuable tip to know as nothing is worse than being in some unknown town with low fuel trying to jam your RV into a tight situation to refuel. Cities take extra planning. Know when rush hour might be, what the bypass route is, and if they have tolls ahead of time. 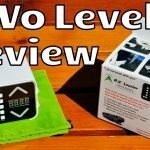 The internet is a wonderful resource and if in doubt about the routing go to one of the many good forums like RV.net, IRV2.com, RVForum.net and just ask. You’ll usually get a boat load of information back from folks that have done the same route, or have intimate local knowledge – an RVers dream! 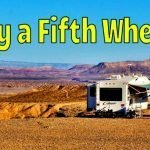 A big problem fifth wheels trailers face is blow out of the tires. All the weight and stress eventually is only on that little patch of rubber meeting the road. I watch my tires like a hawk. Before every tow session, I check the pressure, lug nut torque, and visually inspect the sidewall and tread. Also, when stopped for a rest break I feel the tires for overheating, along with the bearings. 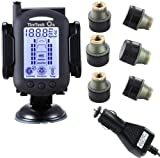 Many people invest in a tire pressure monitoring system and it is on my upgrade list. Replace your tires after five – seven years whether or not they look like they need it. Tires can look perfect, but can be rotten on the inside. Don’t be fooled! 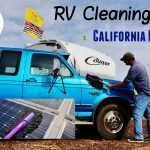 This is especially true if your RV sits for long periods of time without use. I find the wind to be the biggest enemy to my trailer towing experience. Being that the RV is nearly 13-feet high and box-shaped any sort of wind has a dramatic effect. The worse scenario I’ve experienced is on the big Interstate Highways when traveling among the tractor trailers. When it’s really gusty and they are passing by you pushing a lot of air themselves there’s a “push-pull effect” that happens that you must be aware of. Wind also devastates fuel mileage and is hard on the truck trying to pull an RV through it. It’s worse too if you add hills into the equation. I always check the weather and tend to plan my tow days around the wind. Many times I will leave a day early or a day late so I get the least amount of wind. One time we were towing across South Dakota’s rolling hill country into 30 mph winds, and decided we’d had enough and just pulled into a fancy RV Resort to wait it out. Sometimes, you may as well spend the money on a nice place than on diesel fuel and a “no fun” towing day. I figure anything above 25 mph in the wind is no fun. 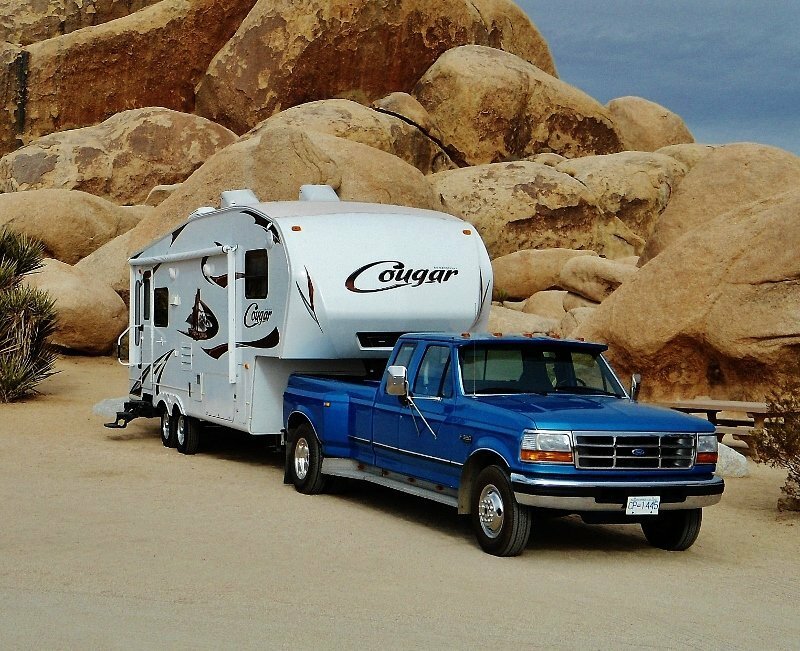 This can be the most intimidating part of fifth wheel ownership – the dreaded backing into a campsite with the local peanut gallery watching your every move. First tip is take your time, rushing it is only going to enhance the chance of problems. Fifth wheels respond to your steering input in a delayed manner so by going slow you have a better chance to correct a misguided path. It will help too if you can pull a good distance ahead before backing in to allow plenty of space for a gradual turn into the spot. Second always use a spotter! Have a good simple set of hand signals and make sure the spotter is always visible in your mirrors. A set of two-way radios or cell phones for communication is another good option. Third is GOAL. GOAL stands for “get out and look”. I will sometimes do this twice or more if in doubt. There is never shame in looking. It’s actually an acronym used by professional truckers. Fourth, look at your tires. I always watch the path the tires go as I know that this is where the trailer will follow. If you watch the back of the trailer it can get you out of line quickly as there is a large swing to the end and doesn’t follow the same arc as the tires. Also, when backing up don’t forget about the front end of the truck. It’s so easy to get wrapped up in the looking backward that you might just crash into something that’s right in front of you. Finally always look up and have your spotter look up too. It’s so easy to forget how high RVs are. A low tree limb can ruin your camping trip and not only put a dent in your RV but in your wallet too! Remember that traveling in the RV is not a race and meant to be enjoyable. Make sure that you don’t overdo the mileage. I tend to stick to between 100 – 250 miles as a nice distance to travel in a day. I feel any longer than that and you start to speed and get tired; two really bad things on the highway. If you feel tired just pull over somewhere and take a nap you have your house with you after all. Instead of taking the fastest Interstate Highway, try a slower secondary road. You never know what you might discover and what you might see!